#Office365Challenge – Creating Grouped views in SharePoint allows you to simulate folder structures which will assist with user adoption. Personal views and public views can be created which makes it even easier for the user to create their own “navigation” structure. To create grouped views you’ll need metadata. Of course you can already group by Created / Created By etc, but the value add lies in grouping by custom properties for example: Document type. In yesterday’s post we added a custom choice column for Document Types. On the Settings page you will first see the settings, then the columns on the app and the views at the bottom. Click on Create View. 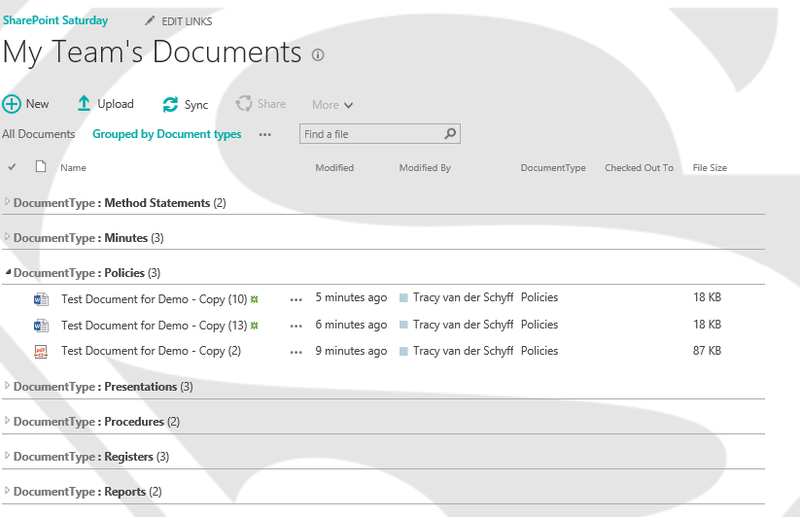 You can copy from different templates, or just copy from an existing view (Start from Existing View), I’m going to copy this view from All Documents. Give the view a descriptive name, switch file size and checked out to on. Now scroll down to Grouped by, changes this to Document Type and change your Number of Groups to Display to more than 30 if you have more than 30 Document types (everyone hates the “Next 30-thing”). Save the changes. This is what your view will look like. Awesome right?! See you tomorrow for some more on views and meta data.